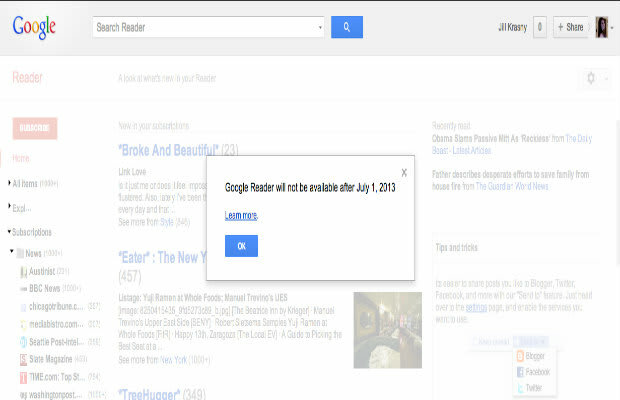 It&apos;s all over now for the beloved RSS feed, Google Reader. The news came late last night, as Google announced it&apos;s doing another spring cleaning of its various services in order to have "more impact." Google Reader, which launched in 2005, has watched its "loyal following" steadily decline, said Google, so on July 1, it&apos;ll be retired. Also going by the wayside are Google Voice App for BlackBerry, Snapseed Desktop for Mac and Windows and Search API for Shopping. The good news is Google fans can export their data, including subscriptions, with Google Takeout over the next four months. Or they can try Fever, a similar feed reader that&apos;s designed for iPhone and iPod touch and integrates with Mac OS X.